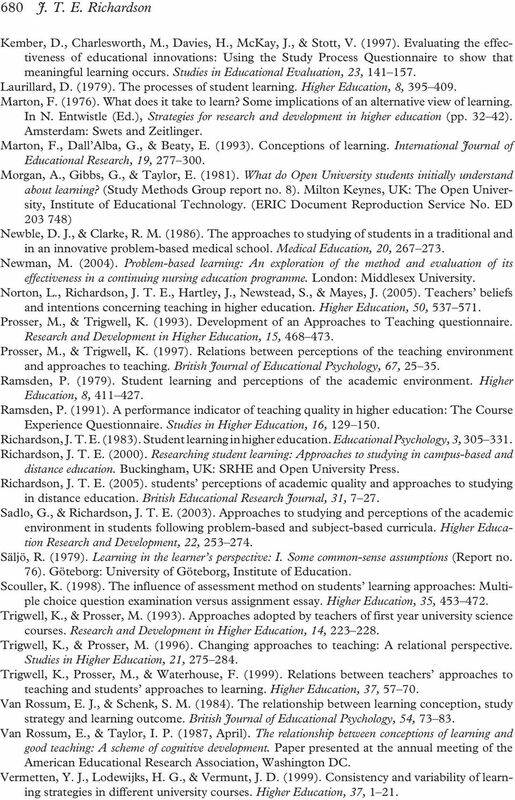 Download "Students Approaches to Learning and Teachers Approaches to Teaching in Higher Education"
2 674 J. T. E. Richardson Approaches to Studying in Higher Education Interview-based research carried out in Britain and Sweden during the 1970s had identified three predominant approaches to studying in higher education: a deep approach, based upon understanding the meaning of course materials; a surface approach, based upon memorising the course materials for the purposes of assessment; and a strategic approach, based upon obtaining the highest grades. Even so, the same student could exhibit different approaches to studying in different situations. In general, the choice of one approach to studying rather than another appeared to depend upon the content, the context, and the demands of particular tasks (Laurillard, 1979; Marton, 1976; Ramsden, 1979; for a review, see Richardson, 2000). Various questionnaires were developed to measure approaches to studying in larger numbers of students, including the Approaches to Studying Inventory (Entwistle & Ramsden, 1983) and the Study Process Questionnaire (Biggs, 1987). Investigations using instruments of this sort confirmed that the same students may adopt different approaches, depending upon the demands of different course units (Eley, 1992), the quality of the teaching (Vermetten, Lodewijks, & Vermunt, 1999), and the nature of the assessment (Scouller, 1998). All these results suggest that one could bring about desirable approaches to studying by appropriate course design, appropriate teaching methods, or appropriate forms of assessment. This has been confirmed in research studies comparing problem-based learning and traditional, subject-based curricula: students following problem-based curricula are more likely to adopt a deep approach to studying and are less likely to adopt a surface approach to studying (Newble & Clarke, 1986; Sadlo & Richardson, 2003). In other research, however, interventions aimed at inducing desirable approaches to studying have proved to be largely ineffective (Gibbs, 1992; Hambleton, Foster, & Richardson, 1998; Kember, Charlesworth, Davies, McKay, & Stott, 1997). 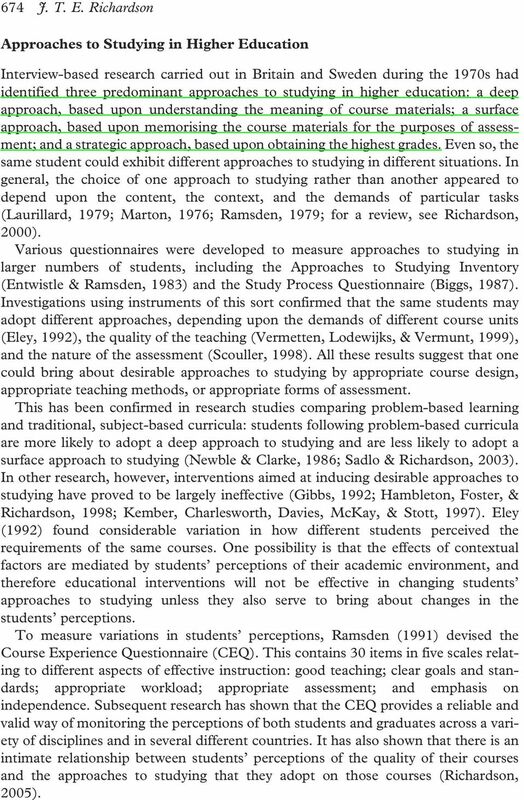 Eley (1992) found considerable variation in how different students perceived the requirements of the same courses. One possibility is that the effects of contextual factors are mediated by students perceptions of their academic environment, and therefore educational interventions will not be effective in changing students approaches to studying unless they also serve to bring about changes in the students perceptions. To measure variations in students perceptions, Ramsden (1991) devised the Course Experience Questionnaire (CEQ). This contains 30 items in five scales relating to different aspects of effective instruction: good teaching; clear goals and standards; appropriate workload; appropriate assessment; and emphasis on independence. Subsequent research has shown that the CEQ provides a reliable and valid way of monitoring the perceptions of both students and graduates across a variety of disciplines and in several different countries. It has also shown that there is an intimate relationship between students perceptions of the quality of their courses and the approaches to studying that they adopt on those courses (Richardson, 2005). 3 Conceptions of Learning in Higher Education Approaches to Learning and Teaching 675 Nevertheless, students still vary significantly in their approaches to studying, even when variations in their perceptions of their courses have been taken into account (Sadlo & Richardson, 2003). Why should students with the same perceptions of the same course adopt different approaches to studying? One possibility is that students may adopt one approach rather than another, depending upon their conceptions of learning and their conceptions of themselves as learners. To explain why different students adopted different approaches on the same course, Marton (1976) argued that students who adopt a deep approach take an active role and see learning as something that they themselves do, whereas those who adopt a surface approach take a passive role and see learning as something that just happens to them. Nevertheless, conceptions of learning show more variety than this. Säljö (1979) asked 90 people aged between 15 and 73 at institutions of further and higher education in Sweden what learning meant to them. He found five different conceptions: 1. Learning as the increase of knowledge 2. Learning as memorising 3. Learning as the acquisition of facts or procedures 4. Learning as the abstraction of meaning 5. Learning as an interpretative process aimed at the understanding of reality. (p. 19) Van Rossum and Schenk (1984) carried out a study with 69 psychology students at a university in the Netherlands. They asked them to read a short text and then interviewed them about how they had approached the task of reading the text and how they approached their studies in general. 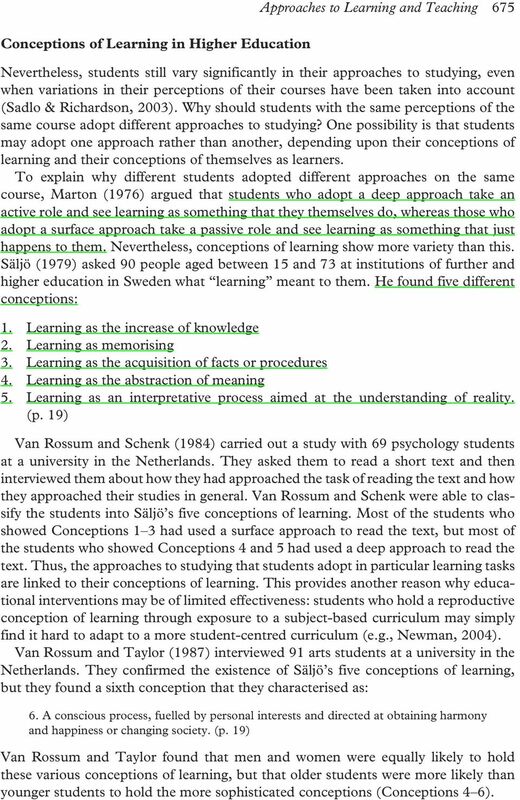 Van Rossum and Schenk were able to classify the students into Säljö s five conceptions of learning. Most of the students who showed Conceptions 1 3 had used a surface approach to read the text, but most of the students who showed Conceptions 4 and 5 had used a deep approach to read the text. Thus, the approaches to studying that students adopt in particular learning tasks are linked to their conceptions of learning. This provides another reason why educational interventions may be of limited effectiveness: students who hold a reproductive conception of learning through exposure to a subject-based curriculum may simply find it hard to adapt to a more student-centred curriculum (e.g., Newman, 2004). Van Rossum and Taylor (1987) interviewed 91 arts students at a university in the Netherlands. They confirmed the existence of Säljö s five conceptions of learning, but they found a sixth conception that they characterised as: 6. A conscious process, fuelled by personal interests and directed at obtaining harmony and happiness or changing society. (p. 19) Van Rossum and Taylor found that men and women were equally likely to hold these various conceptions of learning, but that older students were more likely than younger students to hold the more sophisticated conceptions (Conceptions 4 6). 8 680 J. T. E. Richardson Kember, D., Charlesworth, M., Davies, H., McKay, J., & Stott, V. (1997). Evaluating the effectiveness of educational innovations: Using the Study Process Questionnaire to show that meaningful learning occurs. Studies in Educational Evaluation, 23, Laurillard, D. (1979). The processes of student learning. Higher Education, 8, Marton, F. (1976). What does it take to learn? Some implications of an alternative view of learning. In N. Entwistle (Ed. ), Strategies for research and development in higher education (pp ). Amsterdam: Swets and Zeitlinger. Marton, F., Dall Alba, G., & Beaty, E. (1993). Conceptions of learning. International Journal of Educational Research, 19, Morgan, A., Gibbs, G., & Taylor, E. (1981). What do Open University students initially understand about learning? (Study Methods Group report no. 8). Milton Keynes, UK: The Open University, Institute of Educational Technology. (ERIC Document Reproduction Service No. ED ) Newble, D. J., & Clarke, R. M. (1986). The approaches to studying of students in a traditional and in an innovative problem-based medical school. Medical Education, 20, Newman, M. (2004). Problem-based learning: An exploration of the method and evaluation of its effectiveness in a continuing nursing education programme. London: Middlesex University. Norton, L., Richardson, J. T. E., Hartley, J., Newstead, S., & Mayes, J. (2005). 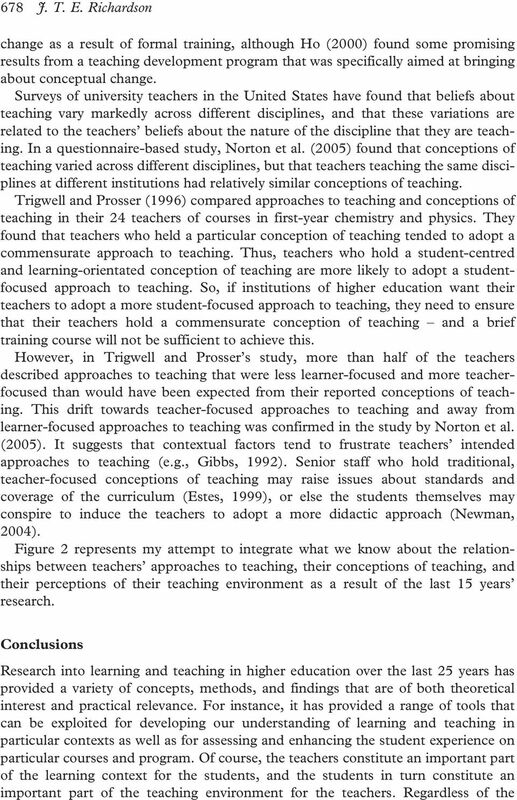 Teachers beliefs and intentions concerning teaching in higher education. Higher Education, 50, Prosser, M., & Trigwell, K. (1993). Development of an Approaches to Teaching questionnaire. Research and Development in Higher Education, 15, Prosser, M., & Trigwell, K. (1997). 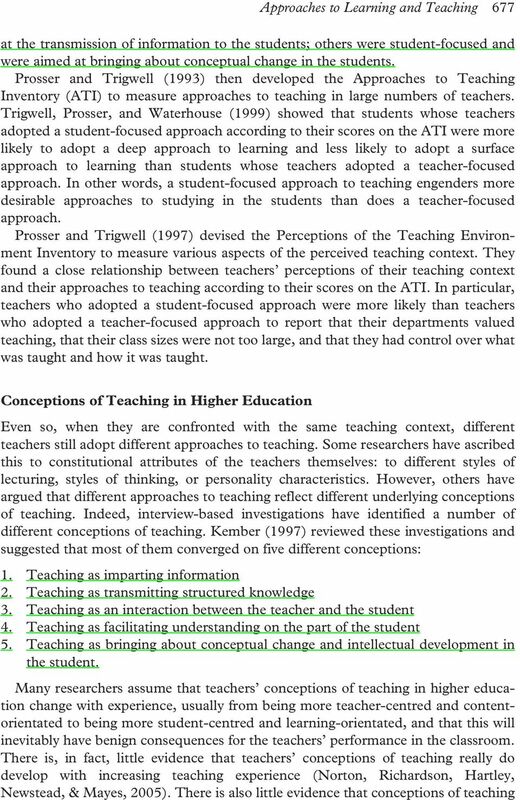 Relations between perceptions of the teaching environment and approaches to teaching. British Journal of Educational Psychology, 67, Ramsden, P. (1979). Student learning and perceptions of the academic environment. Higher Education, 8, Ramsden, P. (1991). A performance indicator of teaching quality in higher education: The Course Experience Questionnaire. Studies in Higher Education, 16, Richardson, J. T. E. (1983). Student learning in higher education. Educational Psychology, 3, Richardson, J. T. E. (2000). Researching student learning: Approaches to studying in campus-based and distance education. Buckingham, UK: SRHE and Open University Press. Richardson, J. T. E. (2005). students perceptions of academic quality and approaches to studying in distance education. British Educational Research Journal, 31, Sadlo, G., & Richardson, J. T. E. (2003). Approaches to studying and perceptions of the academic environment in students following problem-based and subject-based curricula. Higher Education Research and Development, 22, Säljö, R. (1979). Learning in the learner s perspective: I. Some common-sense assumptions (Report no. 76). Göteborg: University of Göteborg, Institute of Education. Scouller, K. (1998). The influence of assessment method on students learning approaches: Multiple choice question examination versus assignment essay. Higher Education, 35, Trigwell, K., & Prosser, M. (1993). Approaches adopted by teachers of first year university science courses. Research and Development in Higher Education, 14, Trigwell, K., & Prosser, M. (1996). Changing approaches to teaching: A relational perspective. Studies in Higher Education, 21, Trigwell, K., Prosser, M., & Waterhouse, F. (1999). Relations between teachers approaches to teaching and students approaches to learning. Higher Education, 37, Van Rossum, E. J., & Schenk, S. M. (1984). The relationship between learning conception, study strategy and learning outcome. British Journal of Educational Psychology, 54, Van Rossum, E., & Taylor, I. P. (1987, April). The relationship between conceptions of learning and good teaching: A scheme of cognitive development. Paper presented at the annual meeting of the American Educational Research Association, Washington DC. Vermetten, Y. J., Lodewijks, H. G., & Vermunt, J. D. (1999). Consistency and variability of learning strategies in different university courses. Higher Education, 37, 1 21. Promoting deep learning through teaching and assessment: conceptual frameworks and educational contexts. What do Chemical Engineering Undergraduates mean by Sustainability? What do third-year Speech Pathology students think of student-centred learning? Issues in Higher Education: Is the concept of a powerful learning environment useful? What is the impact of multisource learning on History at Key Stage 3? Designing multidiscipline cases Asplund, Carl-Johan; Jordan, Paula F.
Concept-Mapping Software: How effective is the learning tool in an online learning environment? DISTANCE EDUCATION: A Second Best in Learning? Turkish Online Journal of Distance Education- TOJDE January 2000 ISSN 1302-6488 Volume: 1 Number: 1 Article No: 2 DISTANCE EDUCATION: A Second Best in Learning? INTRODUCTION Why people want to learn? Dr.